I’m a sound designer and a composer. Part of my job is creating music to be used in media. This takes time, and I get payed for using that time. So this must mean that, ideally, I would create as much music as possible. Right? Just fill those scenes and levels right up to the brim with all the music I can create so I get payed lots of money for the huge amount of hours I’ve spent doing it. The truth of the matter is that, when it’s used at the right time, the absence of music can be a good thing. As much as I’d like to make the aforementioned theoretical amount of money, there’s no use in doing so by cramming as much music as possible into a project. Stories – whether they’re told by means of gameplay or in a prewritten scene – need highs and lows in terms of excitement. Music can mainly help to accomplish the highs and ‘inbetweens’. If there’s an absence of music during the lows, the effect of the music can be even greater when it eventually starts playing. Of course the amount of highs and lows differ from story to story. The image below is just one example of how the level of excitement can progresss. A succession of sounds – having melody, rhythm or harmony – of which the sources are not part of the portrayed world. To clarify; this can either be music in the traditional sense, or more something like a soundscape of freaky synth sounds without any clear melody whatsoever. However, if those freaky synth sounds are meant to come from (for example) an alien space ship we see on the screen, they are considered to be sounds in stead of music. Variation is important. Sometimes a scene is more effective when there’s no music playing at all, and in stead our ears are focused on other sounds that might normally be in the background. The sound of traffic a few streets over, for example, or the persistent ticking of a clock. Another reason for the absence of music has to do with suggestion. Music is mostly meant to awaken a certain feeling (or feelings) within the listener. How this is often used in storytelling is, for example; when a ‘bad guy’ appears on screen, stepping out of his car, sinister music will play. This suggests that the person we’re seeing on the screen is a bad person, or has bad intentions. However, this can also be used to trick us. Maybe this person isn’t half bad at all. He certainly doesn’t look all that bad. Just because some creepy music is playing, doesn’t really have to say anything about him. But if there’s no music playing at all – and no suggestion that comes with it – we can just take the scene as it is; a guy stepping out of a car. When that guy happens to go into a store and rob the place, it’ll probably come as more of a surprise. I’ve mainly talked about film so far, but what about games? Does every level, and every environment, need music? My answer is; not always, and not persistently. Let’s take a game like Skyrim for example. I really love Jeremy Soule‘s music in the game, but after playing the game for over 100 hours, it can feel like a little too much of the same. That’s why I switched off the music at the start of my latest playthrough. I’ve since turned it back on, but the break I got from it was certainly a welcome one. It allowed me to enjoy the sounds of the environments much more: the blowing of the wind, the streaming of a creak, a wolf’s distant howl, the crackling of a fire… It sounded even better with the Sounds of Skyrim mod installed (video below), but the mod is said to cause crashes since a few patches ago so I had to turn it off. In a way though, turning the music off made the game more immersive, because in reality the places you go to don’t have a soundtrack that starts playing when you enter them. 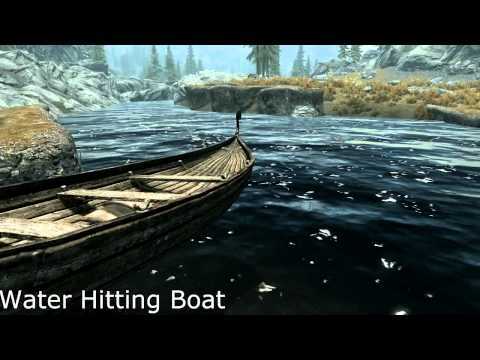 I’m not saying the music in Skyrim is badly placed. Far from it, in fact. Keep in mind, this only happened after 100 hours of playing (which is longer than I’ve played most games). After another 50 hours I felt like turning the music back on (reality can also get kind of boring without it). I’m merely stating that taking a break from music in a game can be a good thing. Another small example: racing games. Sometimes they have no music during the countdown to the race. The music starts when the racing starts. Before that, about the only thing you hear are the countdown timer and car engines roaring wildly in anticipation of the race. This builds up the tension. It gets the player excited to start. And once the race finally starts, it’s on like donkey kong! What it comes down to is that the absence of music can basically be used the same way in games as in film. Does the designer want the player to focus more on certain sound effects? I’d say “turn off the music”. Does he want the music to make more of an impact? Turn it off, then turn it back on when it’s most needed. An absence of music during moments of low excitement can make the effect of music even greater once it starts playing. Leaving out music can bring the focus to other things, such as visuals or less dominant sounds. Music usually brings suggestion with it. The absence of both these things before a certain event can make that event more surprising. The above three principles can be used in both film and games. Do you have any thoughts about when the absence of music can help a story? In part 2 of this article series I will discuss the moments in which music is absolutely essential.